You are currently browsing the CycleStreets blog archives for November, 2010. It basically describes the functionality as exactly as possible of the iPhone app, to make conversion to other platforms easier. If you can help develop our apps, which are on GitHub, with the GPL license, please do drop us a line. Android devs particularly welcome! The document has not yet been fully checked, and a few missing API call examples (though they just mirror what's online) need to be added, but it is 99% done now. Please let us have any comments on things that are not clear or where implementation would be ambiguous. As stressed in the foreword, the spec is merely a template for creative work, not an exact blueprint for implementation, since other platforms will do things differently and the existing app needs changes anyway. We were delighted to discover today that CycleStreets is featured as the default front page item on the government's relaunched data.gov.uk website! We're really pleased to see the work of thousands of cyclists and others around the UK recognised through this feature. "It would be good if CycleStreets got UK Government money/co-operation." We are continuing to try to obtain funding as part of our new Funding drive, to raise £90k to facilitate much faster development of CycleStreets over the coming 18 months. CycleStreets is set up on a not-for-profit basis, and is free for people to use. However, this does not mean that it costs nothing to run. CycleStreets does not currently pay full salaries to the core developers, meaning that only limited time for improvements is available. We have to survive and so have other jobs that take up our time. With full-time development staff, CycleStreets could reach its full potential much more quickly, and will help support getting more volunteers to work on the project. Although in the longer term, the open-source model of a development team is where we wish to be at, routing work and analysis is complex and requires often weeks of solid, concentrated work. This makes it difficult to get volunteers, as they are more likely only to be able to 'dip in' to the code; the latter is useful for a range of smaller improvements, but more limited in terms of our core competency of endeavouring to create world-class cycle routing. Dogfooding, for those who haven't come across the term, is programmers' jargon for 'trying out your own product', i.e. eating your own dogfood! While cycling around in London recently I made use of two great cut-throughs, thanks to our iPhone app and the great mapping done by OpenStreetMap folk. These are the kind of cut-throughs for bikes which would never have found these looking on the default map/routing on the device. A lovely cut-through across the river and near the University. I later also took the opportunity to add a location needing cycle parking, at some nearby shops, for the Cycle Parking 4 London campaign. I often need to do this route, and for a long time I've gone along Euston Road and straight down Russell Square, which I've never liked due to the traffic. I did find that the Drake St junction has changed a little from what's on the map, so I've added this to the OpenStreetBugs website (I could have reported it via our own feedback system, but that would be like sending myself e-mail! ), so that it can be resurvey soon by a local OSMer. If you like the app, please do give us feedback in the App Store! London Cycling Campaign's www.cycleparking4london.org.uk website, which we helped create, is continuing to see requests for new cycle parking locations pouring in. The site enables members of the public to submit suggestions of places needing cycle parking, which will then be used by local campaigners. The last two screenshots show the process of adding a photo. For those in Cambridgeshire, you can go to www.CyclingSorted.org which is a site we created for Cambridgeshire County Council. Please vote for us, to help us get £5k of much-needed funding. and click on the voting button next to Simon, one of our main developers. Every penny would be used to improve the website to make it easier to use and produce better quality routes. Our users keep telling us these are the main things we need to be working on and we are doing what we can. More funding helps us get this job done more quickly and involve more people. We're pleased to announce the availability of a new domain name to access CycleStreets pages via shortlinks – useful for adding to Twitter and other messages. http://cycle.st/pm – redirects to the Photomap main page. The shortlink for each page appears at the bottom-left of the page, so you don't need to remember these patterns. PS We were planning originally to use cyclestree.ts but it turns out we'd have to wait for a new country to be founded – .ts doesn't exist as a country code! CycleStreets, the UK-wide cycle journey planner website, today reached a new milestone: a third of a million cycle journeys planned. Route 333,333 was a typical cross-city route, in Cambridge. The 333,333 journeys amounts to 3.85 million km of route planning – that's an awful lot of cycling! This is also the equivalent of cycling to the moon ten times, or cycling round the earth almost 100 times. CycleStreets is an independent project created by two cycling web-developers based in Cambridge. It uses the excellent data in OpenStreetMap which is collected by thousands of people all around the UK, creating the 'Wikipedia of maps'. Cyclists – and anyone else – can get involved by adding information to www.openstreetmap.org. CycleStreets is truly a project for cyclists, by cyclists. Planning a cycle route is quick and easy with CycleStreets. Just go to www.cyclestreets.net, search / click on a start point and finish point, and hit the 'Plan route' button. A map and detailed journey plan is given. People can also plan a journey on the move. A free mobile phone version of CycleStreets is available at www.cyclestreets.net/mobile – currently for iPhone, but Android and other versions are in the works. A range of other apps, including great apps from Bike Hub (including a bikeshop finder), Cycle Hire app, London Cycle, and London Bike App also make use of CycleStreets routing – with other app-makers coming on board to add cycle-friendly routing to their apps. "Brilliant facility. 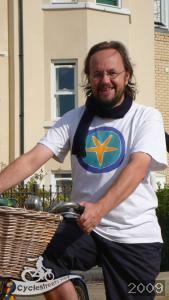 I have just started cycling to work and found it very useful for planning routes and trying them out." "As cycling advocates and campaigners, one of the things we hear most often from people who don't cycle is their fear of traffic. We've built CycleStreets to help them discover cycle-friendly routes and cut-throughs you never knew existed. CycleStreets aims to be like a knowledgeable cyclist, wherever you are in the UK." CycleStreets will this week be launching a funding drive to raise funds for two full-time developers. With so many requests for new features and ways of using the system coming from user feedback, we want to move CycleStreets to the next level.